In April 1971, a Proclamation was signed by the Governor of South Australia which excluded all portions of the South Australian coast from the low water mark to 800 metres inland from mining exploration and inining operations. In late 2009, Rex Minerals applied to the SA Government to remove the coastal protection status from a portion of the YP coast to enable them to conduct exploratory operations at, and in the vicinity of, Hillside. In January 2010, Rex also wrote to the YPDC inviting its comments. Council’s response? It had no comment to make. The Government subsequently endorsed Rex’s application and in May 2010, the Deputy Governor signed the Mining(Reservation from Act)(Coastal Land) Variation Proclamation 2010 to that effect. 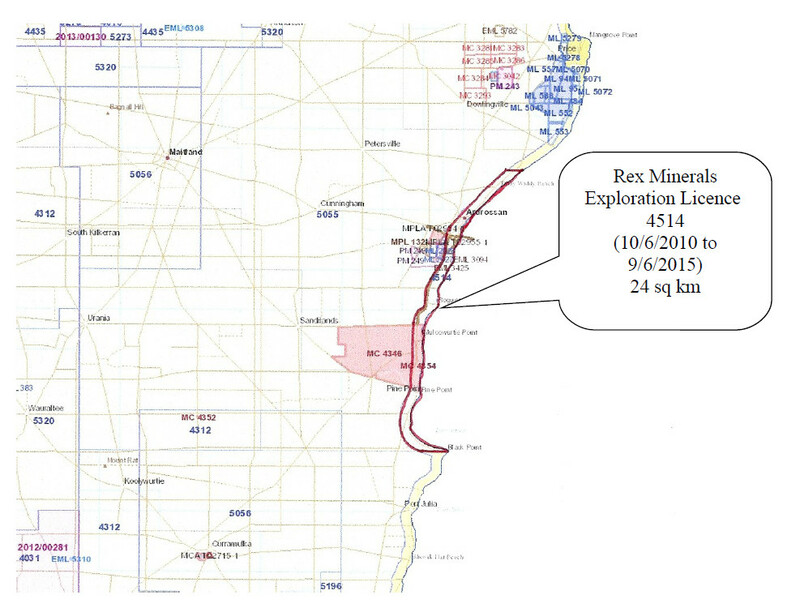 This allowed Rex Minerals to obtain an Exploration Lease (No. 4514) covering not just the 6+ kms of coastline that is now part of their Hillside Mining Lease proposal but also extends from the tip of Black Point to just north of Tiddy Widdy – a distance of 25 kilometres covering an area of 24 square kilometers. It includes sections of the Ardrossan and Pine Point townships, and the whole of the holiday settlements of Black Point, Rogues Point, James Well and Tiddy Widdy (see Figure 1). Rex Minerals is entitled to explore for uranium, copper, gold and iron within this 24 km coastal area and has also integrated the 6+ kms stretch of this previously protected coastal reserve into their proposed Hillside Mining operation, where it will be used for a major diversion of the St Vincent’s Highway and a large waste rock dump. Why was this variation granted? Why was there no widespread public consultation, even though hundreds of houses fall within that zone? What are the implications for residents’ rights as property owners now that they sit within a mining exploration zone?